July 5th, 2008 - Dolphin 24s have a racing heritage. 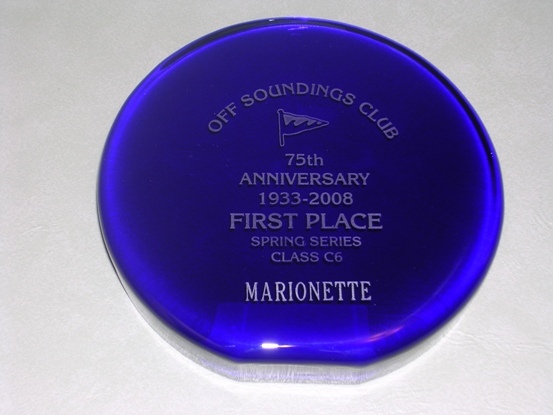 Here's some of Marionette's contribution - starting with the 75th Anniversary of the Off Soundings Club Spring Series. This is a 6" diameter, 2 " thick, engraved glass disc with a flat on the bottom so you can stand it on your desk and look at it - constantly. 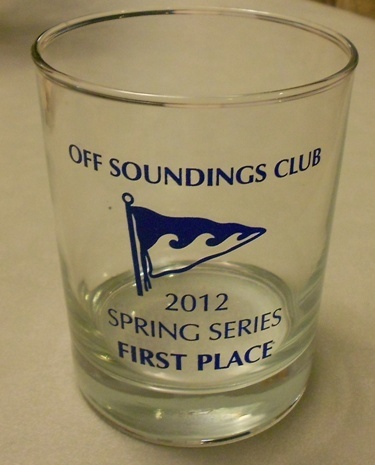 The Off Soundings Club (OSC) is a 500 member club without any land based facilities, was founded in 1933, and runs offshore regattas in southeastern New England. There is a Springs Series in early June from Watch Hill, Rhode Island out to Block Island on day one, and a race around Block Island on day two. In September there is a Fall Series with Race one usually from New London, CT out to Shelter Island, NY, and then on day two a race out in Gardiners Bay. 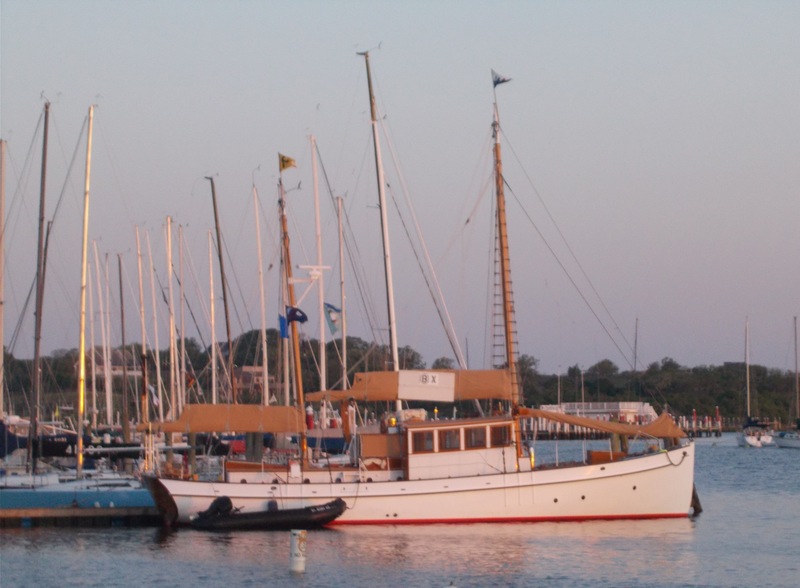 In recent years there have been 125-150 boats racing in 10-12 classes, mostly PHRF. After racing each day there is a traditional party under 'the tent' with the Bourbon, Scotch, Gin and Vodka barrels identified only by their signal flags. OSC racing crews occasionally have problems identifying the RC signals but B, S, G and V signals are never missed. 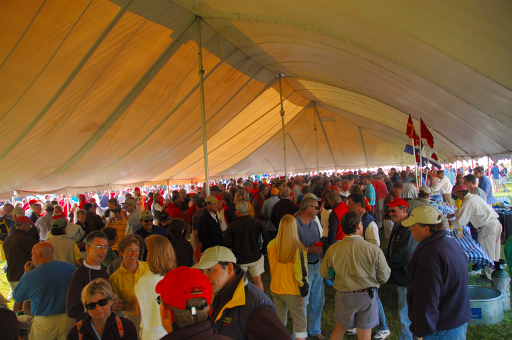 After allowing the prescribed marinating period, the club's officers, in their blue blazers, read the results to 700-800+ assembled racing crews. 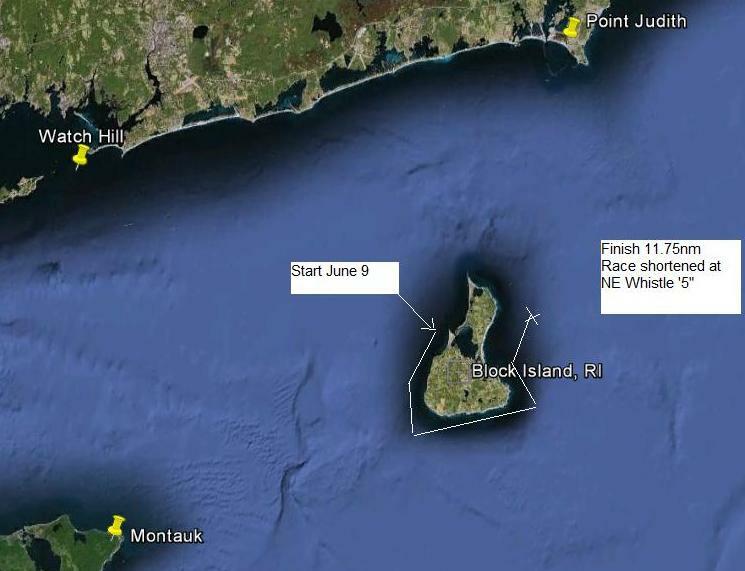 The Spring Series start is usually off Watch Hill, RI and, while the Race Committee takes due note of the wind conditions and forecast, most importantly, they recognize the importance of Rule #1 - getting the fleet to Block Island in time for the party. The Committee boat is Henry DuPont's magnificant Nor'easter, a 60' William Hand classic motorsailer, pictured here on a blustery rainy race day in 2003. August 26, 2012 update Click here for a larger photo - click your browser's back arrow to get back here. And, click here to go to Nor'easter's own website. 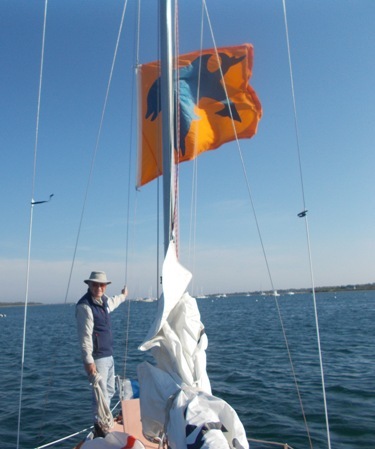 Race One this year (2008) had light breezes of 5-10 knots right on the nose for the course to the Great Salt Pond entrance to Block Is. The normally 18-20 mile course was set assuming the breeze would veer to the southwest and west. The breeze stayed light and the race was ultimately shortened in conformance with Rule #1 above. The race was essentially a long beat to Block. Marionette worked her way up the middle of the course to win on corrected time by nearly 7 minutes. On day two the breeze was also light, maybe bit stronger than day one. The course was counterclockwise around the island. Marionette, being a Dolphin, was able to stay in close to the bluffs (and the thinner water) where the breeze was better. The downwind portion on the long southern side of the island featured many gibes to get to, and stay in, better breeze. Marionette's big downwind spinnaker was a killer. Some bigger boats, jealous of the better breeze, and having a lot more draft than a Dolphin, came inside with us - several coming into abrupt contact with the many boulders lurking beneath the surface in this area. Marionette's winning margin was just over 5 minutes. Webmaster Note: It must be mentioned here that, in this race with all 12 classes racing the same course, Marionette's was one of only 3 boats to finish under 4 hours, and her corrected time of 3:50.55 was the best corrected time for the entire 132 boat fleet! Complete results can be seen by clicking here. 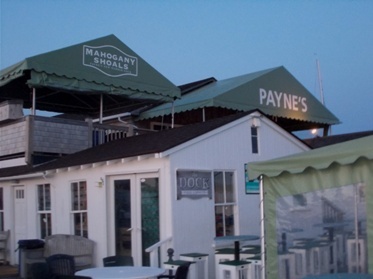 Now for a few words on handicaps....You might want to fix yourself a strong drink here, maybe a double if you are not a Dolphin owner.... And some might want to start with a visit to US Sailing's website on PHRF. Click here to go to it. 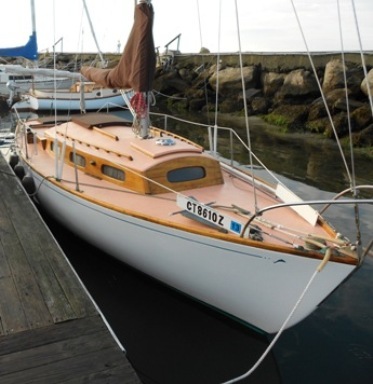 The eastern CT PHRF handicap for Marionette racing in a spinnaker class is 252. You can see a copy of her racing certificate by clicking here. 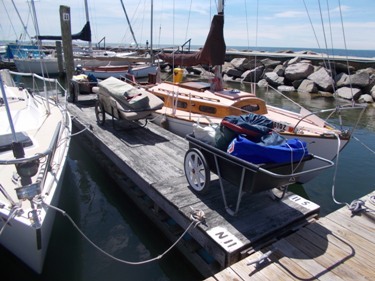 It ordinarily would be 261 but she carries a 6 sec penalty for her outboard motor (stored below when racing) and a 3 second penalty for her 170% light air genoa. The Off Soundings Club takes this basic rating and applies additional factors - interesting, and important to Dolphins. 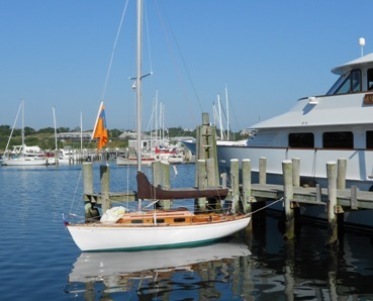 The smallest boat that is allowed to race must be 24' LOA, and the highest PHRF handicap allowed is 300. 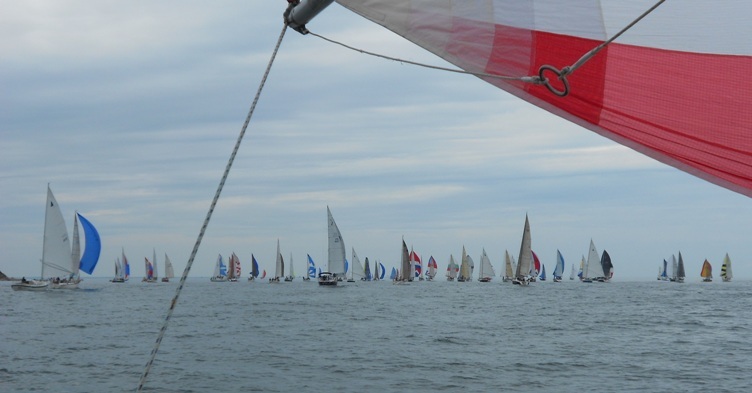 There are not many of us left in this rarified atmosphere as most boats racing now are below 200. 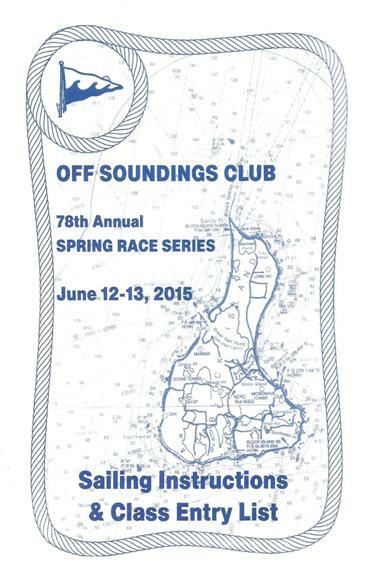 OSC races tend to be 18-20 miles in length, often lasting 4-5 hours. Since long or light wind races tend to disadvantage older, 'slower' designs like Dolphins when using Time on Distance PHRF handicaps, OSC converts the handicaps to Time on Time. where a PHRF handicap (HCP) of 120 (480 + 120) would yield a TCF of 1. * In addition, OSC applies a penalty to the PHRF handicap that each yacht carries based upon her top 3 finish results in the prior 3 regattas. For example, Marionette, because she won the Spring Series, will carry a 15% (of her PHRF handicap - .15 x 252 = 37.8) in the next series. Assuming she did not place in the top 3 positions in the next 3 regattas, this penalty would reduce to 10%, then 5%, being removed completely after the 3rd regatta. Penalties may accumulate to a maximum of 45%. The purpose of this special OSC penalty system is to keep the racing fun and competitive. Suffice to say that Marionette won both days with and without consideration of the OSC penalties. There's more on this subject at the end of this page. So (another drink? ), the Time Correction Factor (TCF) for Marionette for the 2008 Spring Series was .8197 applied to her elapsed time. These are the results of Races 1 and 2. When time and fortitude permit, an exhaustive analysis of race results with and without OSC penalties, and under both Time on Distance and Time on Time handicap methods will be attempted. Another drink? 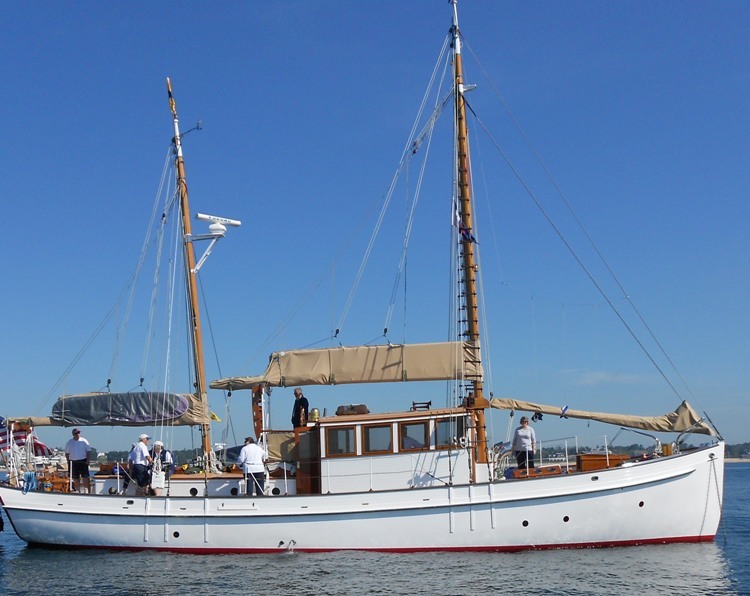 June 18, 2009 - Marionette, based on her performance at this regatta, placed 2nd in the competition for Sparkman & Stephens Association's 2008 Global Challege Trophy Award - For best performance by an S&S designed yacht. 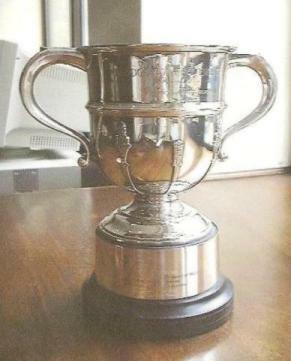 Click here for more on this award. April 10, 2011 Webmaster Note: She won this trophy in 2010!. June 27, 2015 Webmaster 2nd Note; She has been nominated again for 2015 for her perfomance in this year's regatta! April 14, 2016 Webmaster 3rd Note - She won!!! June 18, 2010. 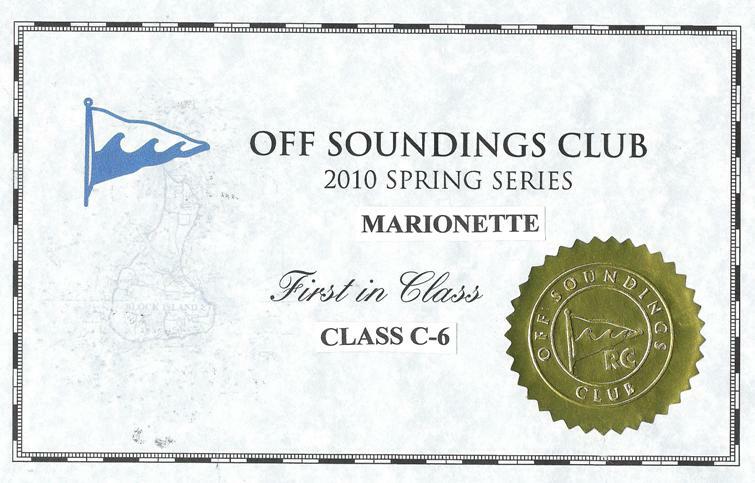 Marionette won her class again in the Off Sounding Club Spring Series in 2010. 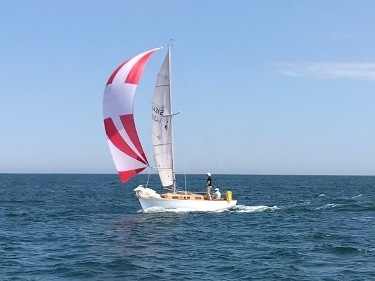 Friday's race out to Block Island was a light air drifter - no one finished by the 5PM deadline, so all the marbles rested on Saturday's Around Block Island Race. Did I mention she also won this same series in 2004? June 12, 2012. Marionette won her class again in this year's Off Sounding Club Spring Series. This was a light air event - which are a Dolphin's favorite conditions. 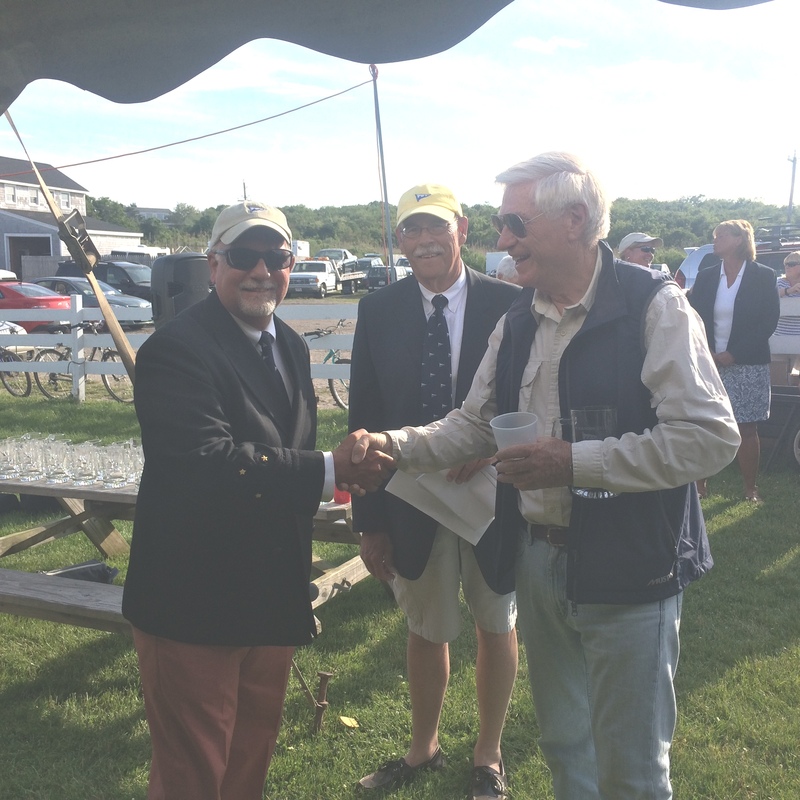 The regatta had a great turnout - 138 boats in 12 classes. On Friday, June 8, after a 20 minute postponement waiting for wind, Marionette won the first race in Class C-6 (6 boats). 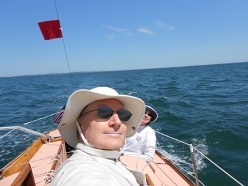 Winds were 5-10 knots. 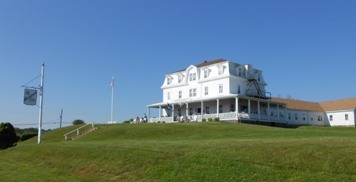 The start was off Watch Hill, Rhode Island. 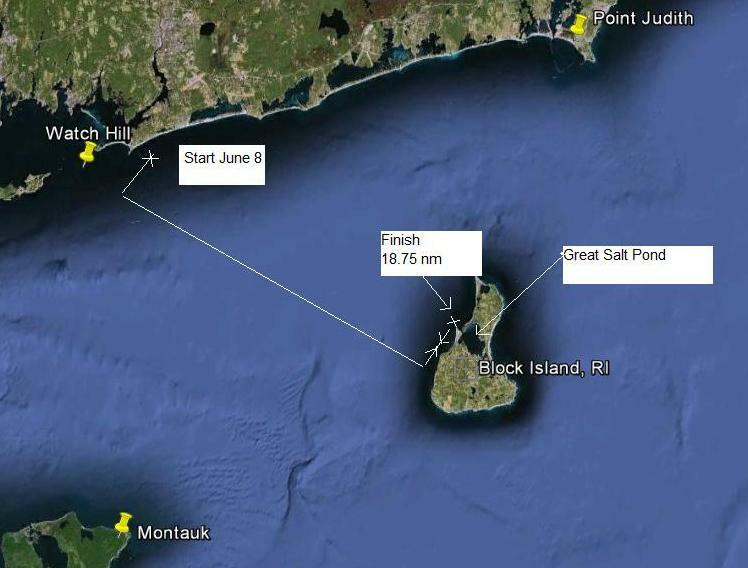 Leg 1 was a one mile beat to the weather mark, then a long 13 mile beat to Block Island, followed by a short downwind spinnaker leg down to the entrance to Great Salt Pond, a beat back to the previous mark, and another spinnaker leg back to the finish at Bell R 2, off the entrance to Great Salt Pond. 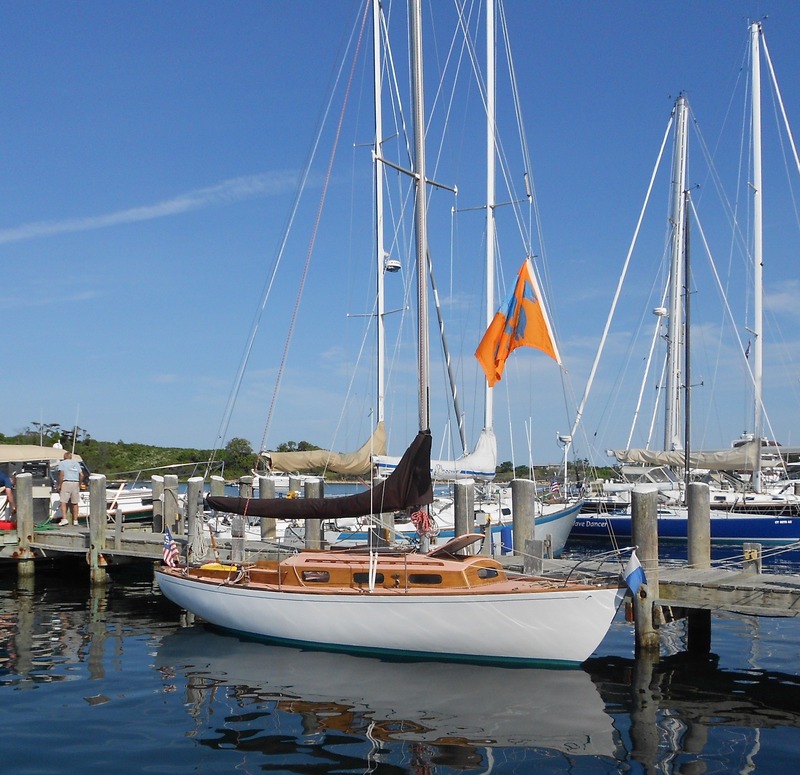 On Saturday, after a 30 minute postponement waiting for wind, the fleet started just off the the entrance to Great Salt Pond. 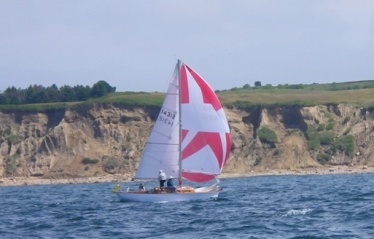 The course was counterclockwise around Block Island. The wind died, then came back, then died - racing was a 'total crap shoot' - winds were 0-7 knots. 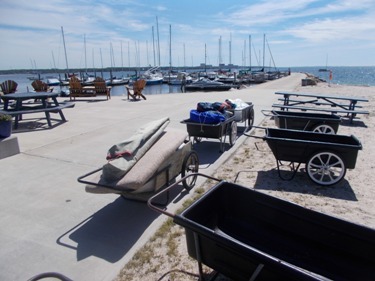 After getting caught in a windless hole and watching the entire fleet slowly pass, Marionette finally caught a break on the south side of the Island, and with a breeze filling in from the back, caught 40-50 boats stalled in a line. She broke through the line as the Race Comiittee announced on the radio that the race would be shortened at the next mark. Marionette finished 3rd, which, with her 1st on the previous day, broke a tie with Spartan, a C&C 30, Mk 1, and got her 1st overall. The 'wall' on Saturday - the breeze is filling in from the back! August 26, 2012. An oversight and nearly deleted photos. Marionette's winning crew going home - below left daughter Nicole trimming the spinnaker with webmaster on helm; son Michael, below center with Nicole on the helm; Navigator/webmaster below right. What's with the protest flag? 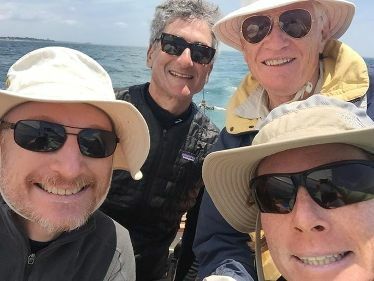 We were 'racing' a Pearson 30 (Euphoria) the 25 miles back home - they were to give us a 30 minute head start - and they left early!! 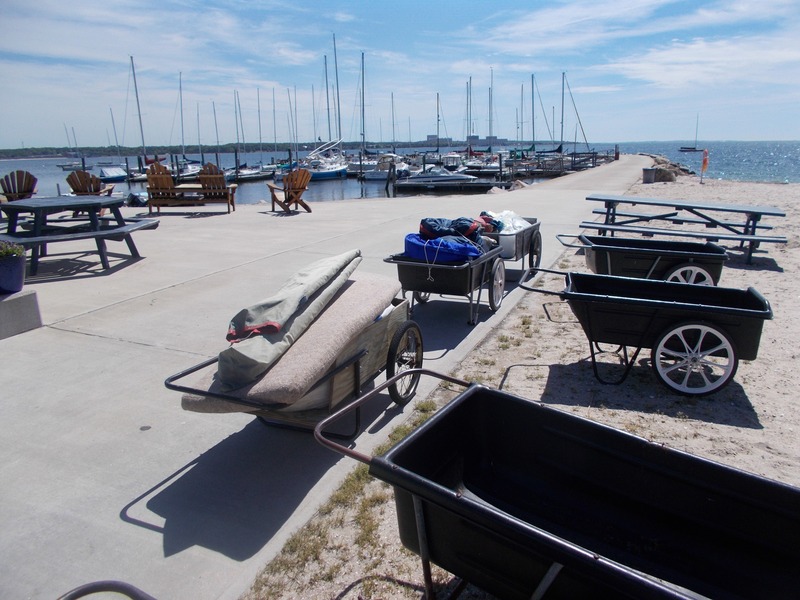 Back home at Niantic Bay Yacht Club - time for a drink! June 13, 2013. The 2013 Off Soundings Club Spring Regatta is scheduled June 14 and 15, and Marionette was entered. With a eye to the weather forecast she officially withdrew at 9:50 AM. The NOAA marine weather 'upgrade' from gale watch to gale warning issued at 7:14AM for Block Is Sound race area was determinative for us. 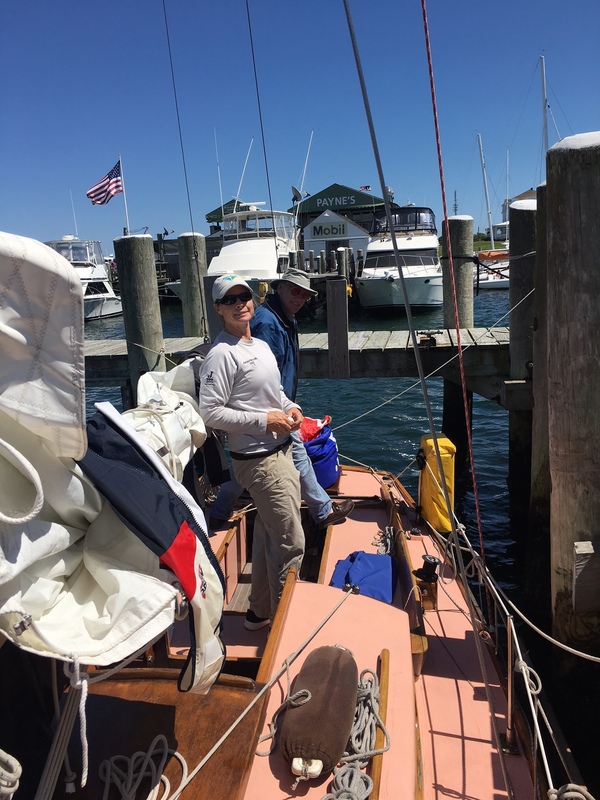 Plus, we had 18 miles due east to sail to get to our mooring in Stonington on Thursday afternoon, in heavy rain and wind on the nose - Nope. This is big boat weather. THIS AFTERNOON... E WINDS 15 TO 20 KT WITH GUSTS UP TO 30 KT. SEAS 2 TO 4 FT. RAIN. VSBY 1 NM OR LESS. TONIGHT... NE WINDS 20 TO 25 KT WITH GUSTS UP TO 35 KT. SEAS 4 TO 7 FT. PATCHY FOG. RAIN. VSBY 1 NM OR LESS. FRI... NE WINDS 15 TO 20 KT WITH GUSTS UP TO 35 KT...BECOMING N 10 TO 15 KT WITH GUSTS UP TO 25 KT IN THE AFTERNOON. SEAS 5 TO 8 FT. PATCHY FOG. RAIN. VSBY 1 TO 3 NM. 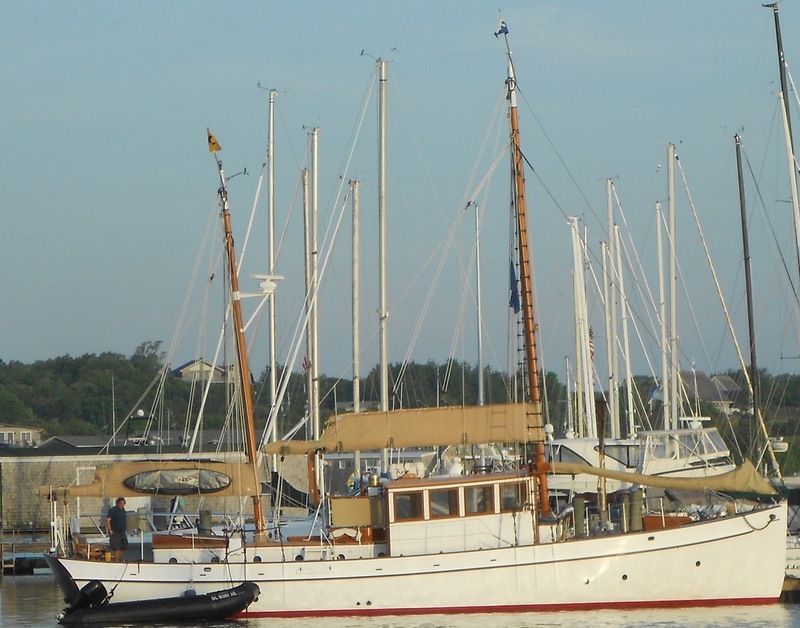 Some may find it interesting to see what kinds of boats Marionette would have had to race - and their PHRF ratings. Here is the Class A entry list. Marionette was assigned this year to this class as part of an effort to reorganize all classes into a more competitive system. 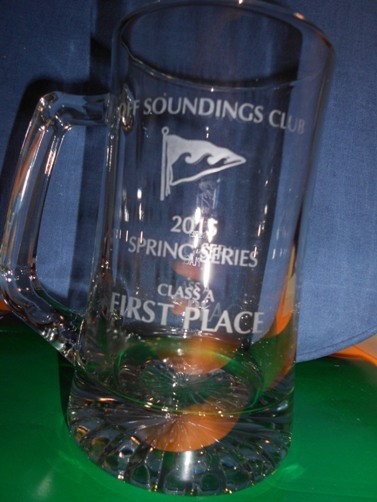 The Off Soundings Club assigns a 'penalty' based on prior results (PE), and OSC also uses the the Time on Time version of PHRF. 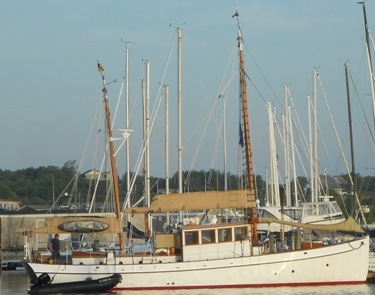 The TCF (Time Correction Factor) column represents the factor by which a yacht's elapsed time is multiplied to get her corrected time. 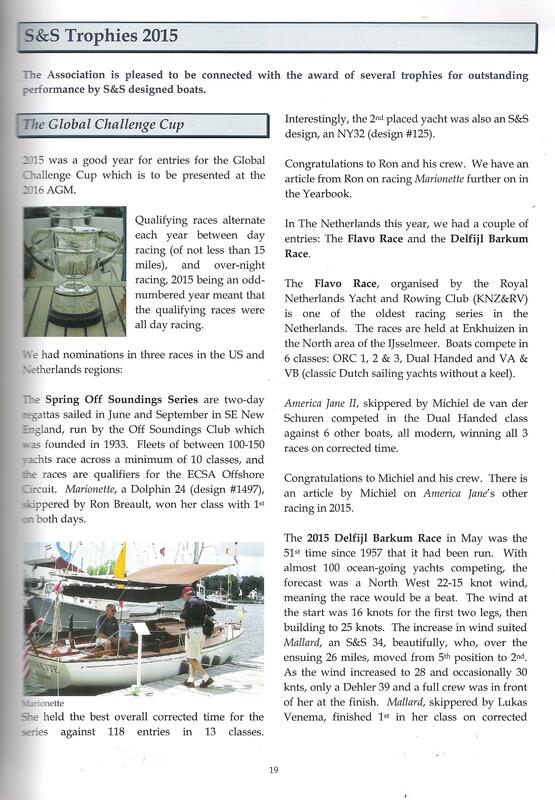 The factor covers both the OSC applied 'penalty' plus the PHRF handicap. In the above chart the scratch boat, ROGUE's finishing time would be multiplied by 1.0435 and Marionette's by .8475 to get total time :-). The full explantion of this handicap system can be seen by clicking here. PS: The two 40'ers, Moonshine and Quest were 1st and 2nd. 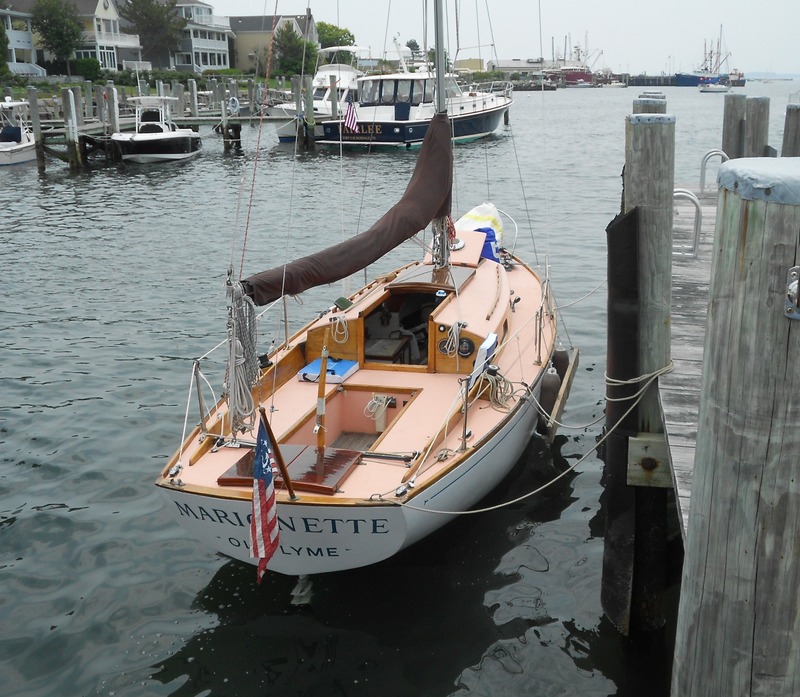 June 15, 2015 We know these Off Soundings boats miss her when Marionette takes a year off so we decided we had to do this regatta again. And, to celebrate her 55th year she did it again, winning her Class with 1st place finishes in both races!!! Click on photos below for larger images - click the return arrow on your browser to get back to this page. June 16, 2015. We won't bore the reader with the 'get her ready' program which started a week ago. 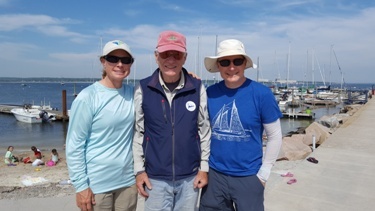 Marionette had lined up a great crew - Saint Francis YC ringers (here also to race at Block Island Race Week in a chartered J/105), daughter/senior DFI Nicole and her husband Bruce, who was racing with us for the first time, plus son Mike. 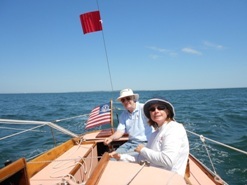 Nicole and Mike were crew for Marionette's previous OSC regatta wins. On Thursday Nicole, Bruce and your webmaster delivered Marionette to Stonington where she spent the night at Dodson's Boatyard. It was a 15 mile downwind trip, with the current, and a light breeze - practice time with the spinnaker in tricky conditions. The Admiral met us at the Dog Watch Cafe for a late lunch, then drove us back to Old Lyme. I picked up son Mike at the Old Saybrook RR Station who was coming in from NYC where he lives. Dinner was the Admiral's famous Chicken Marbella, and dessert was reliving past OSC regattas. Day 1, Friday, June 12. 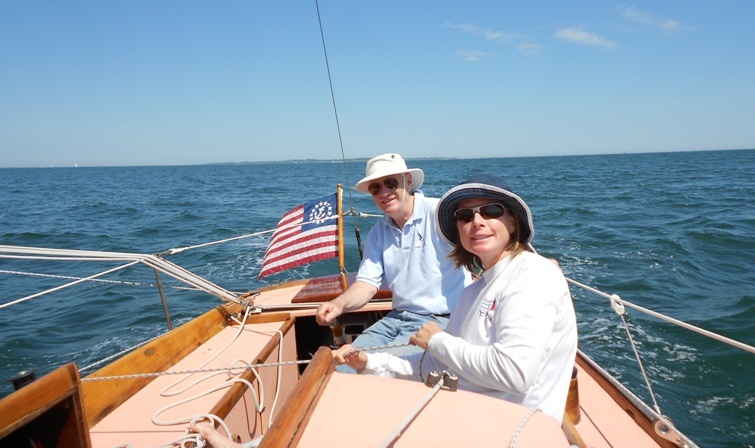 The Admiral drove us to Stonington, and after loading up food and liquid refreshments, we motored for about an hour out through the Watch Hill Passage to the starting area. Thirteen classes, 118 entries. 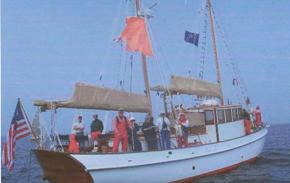 Marionette was in Alpha Class (spinnakers), 6 boats entered, all bigger and giving us lots of time. That TCF factor gets multiplied by total elapsed time to get corrected time. 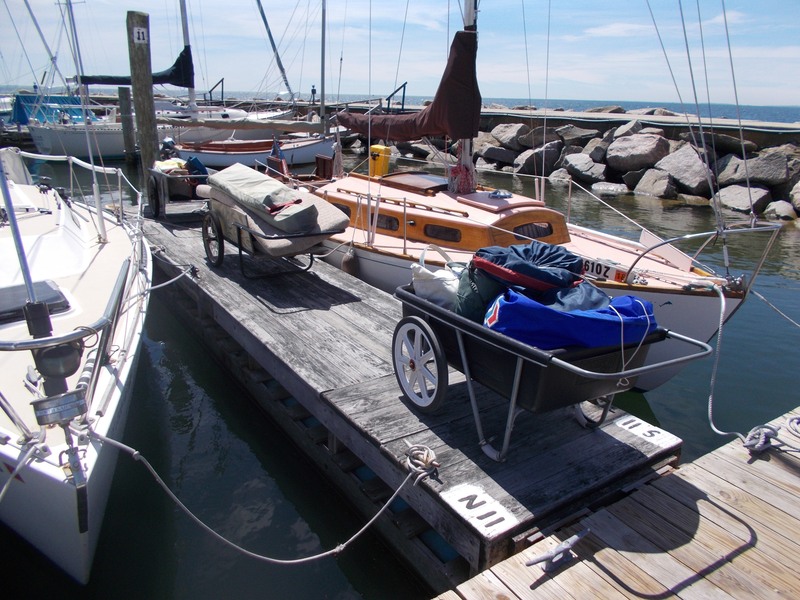 Do the math - on a 5 hour race the scratch boat Moonshine, a Pearson 40 has to give us about 1 hour. 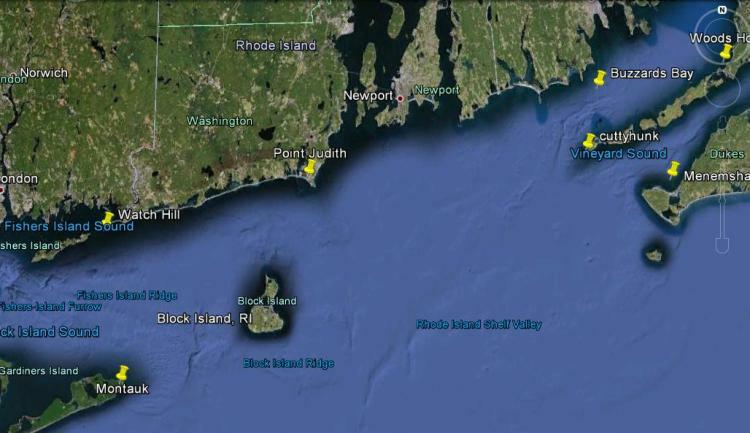 Here's are the courses which were posted on Nor'easter, the principal Committee Boat, just before first warning. 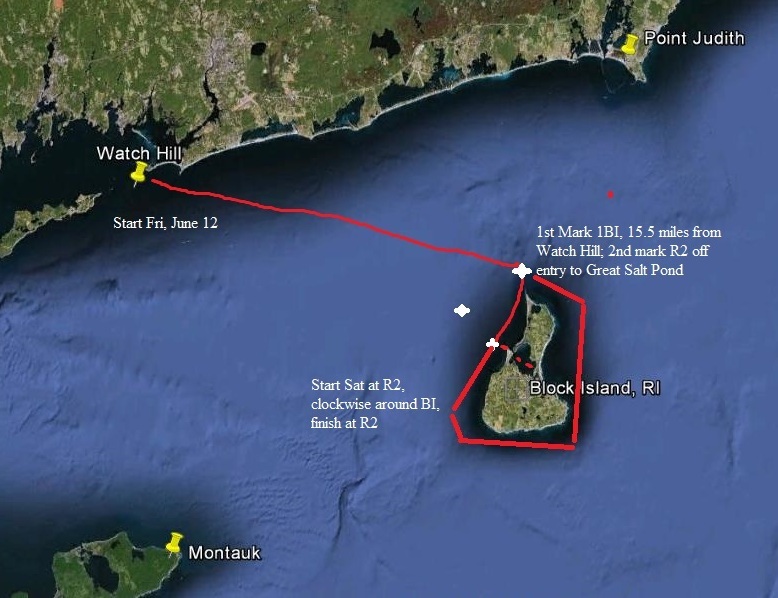 Friday - Watch Hill to Block Island - 1st Mark 1BI, off east end of BI, 15.5 miles, then 3 miles to the R2 bell off the entrance to Great Salt Pond; Saturday's course would be clockwise around BIock Island, about 20 miles. 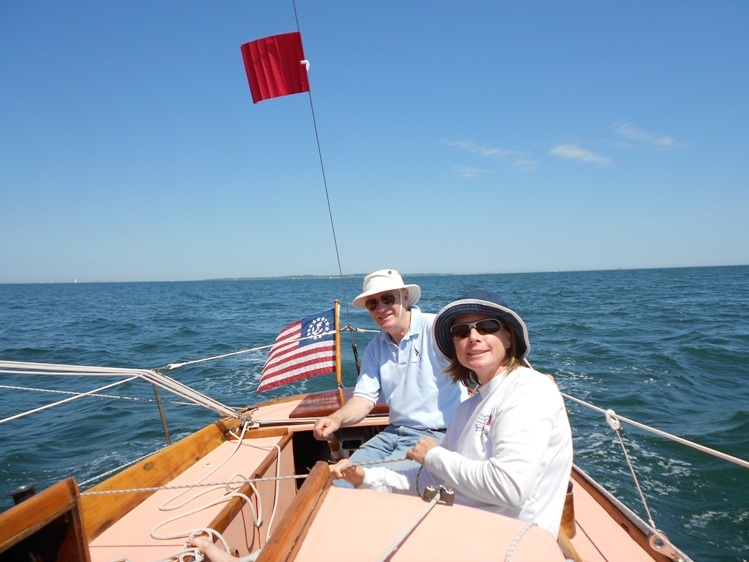 Friday was very light air, and the top priority for the Race Committee is always to get the fleet to Block Island in time for the party. After a 1 hour postponement they just managed to get the starts off beginning around 11:30AM. Then the wind began to really get spotty and fog started to roll in. The RC decided to shorten course and finish at 1BI. Boats had to finish by 5:30 or get scored DNF. Marionette finished at 5:12 just as the fog really closed in. With nearly zero visibility we had to GPS navigate to get to Great Salt Pond. The reading of the results at the party later was particularly interesting as most boats could not see the competitors in their class so did not know how they did. Starting from the bottom of each class the announcer read off the results, and in the Alpha Class, Marionette's name was the last boat to be announced - 1st!!! And, in this race she also had the 2nd best corrected time in the entire 118 boat fleet. 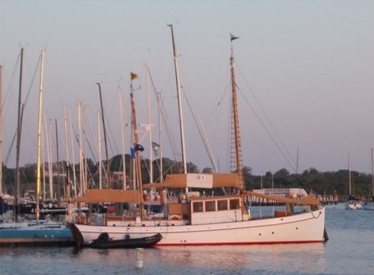 Saturday, there was a pretty strong breeze - Marionette started with her 140 'heavy' genoa and a reefed main. Great start at the pin end. 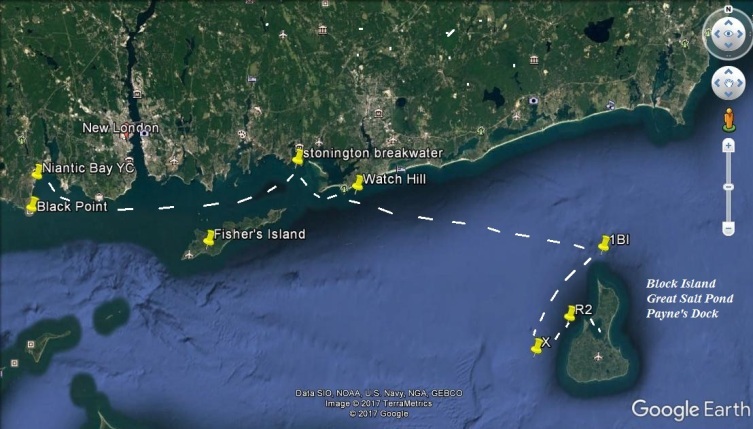 Key moves were to set the spinnaker on the east side of the island and head down closer to shore (Dolphin country) as the wind eased . Then as we approached the southeast corner, we raised the 170 genoa staying as close inshore as we could. Marionette won this race by 43 seconds over Vitesse, the NY32, and in the race she had the 5th best corrected time in the fleet. Coupled with her 2nd best time in Race 1 this gave Marionette the overall best corrected time for the 2 race series in the entire 118 boat fleet. Sunday was a long day for the trip back to Niantic Bay. 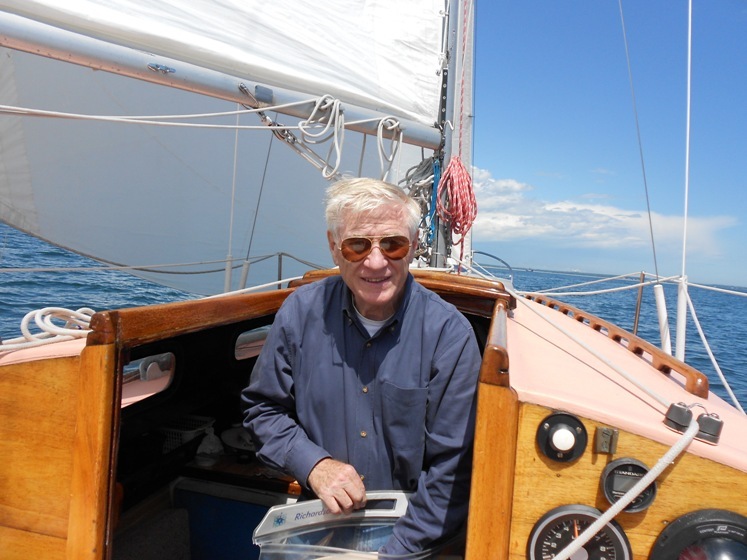 Left at 9, motoring, no wind, foul current, and increasing worries about running out of fuel. But off New London a light breeze came up and we were able to set the spinnaker and made it back to Niantic Bay YC at 4. All together, a great weekend with a great crew, thanks to our pretty 55 year Marionette who still gets the job done. May 25, 2016. Two articles were published in the 2016 Sparkman & Stephens Association Yearbook and released to members last week. 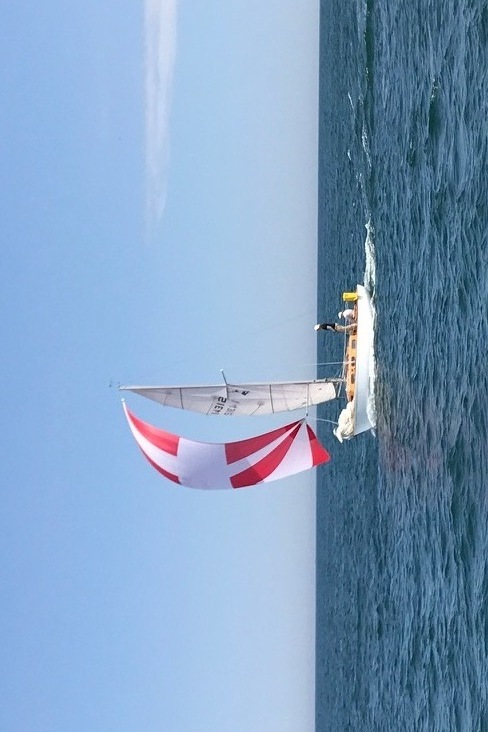 The first article was requested by the editors last Fall and is about Marionette's efforts in recent years competing in the Off Soundings Club Spring Series Regattas. It was published in almost the exact form, text and photos, as the draft submitted by your webmaster last November. Copying the pages from the rather thick book was a task - simply placing the draft in a PDF was much easier. June 14, 2017. Marionette competed in the 2017 OSC Spring Series. We had a busy couple of weeks getting her ready for a 4 day trip, June 8-11, from Niantic Bay via Stonington out to and around Block Island and return - pictures below - packing sails, cushions, gear, etcon Thursday AM June 8 at NBYC. 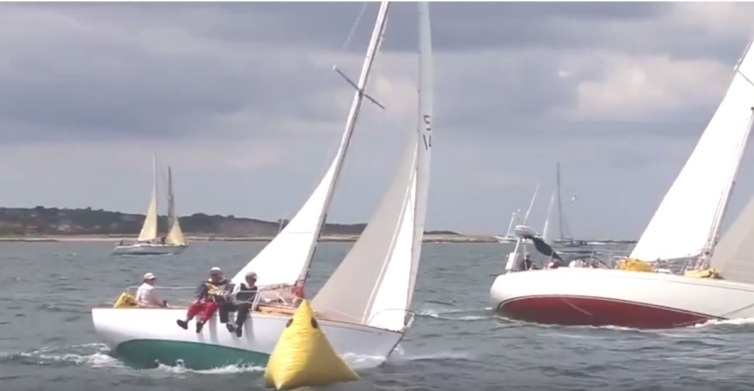 Two races - Marionette 'retired' (RET/MDM) in Race 1 (Webmaster pleaded with crew claiming MDM (Mal de Mere) approaching R2 and unwilling to face the remaining hard beat to Mark X and a run back to R2): But, in Race 2 Marionette won her class! Here's a couple of pictures. Usually, if you click on them you will get a larger image.